After reading three intense books at once - A Suitable Boy, The Worst Hard Time, and Nothing to Envy - I really just wanted something happy and sweet and fun that I could finish quickly. Whew, thank you, Shannon Hale! 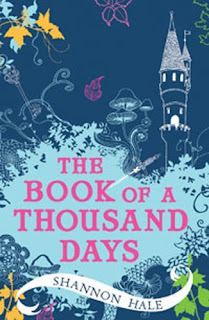 The Book of a Thousand Days was just what I needed. The story starts with the narrator, Dashti, lady's maid to Saren, being locked up in a tower with Saren. Lady Saren refuses to marry the man chosen for her by her father, and so he locks her up in a windowless tower with enough food and candles for seven years. But Saren eats a lot and the rats eat even more and the food runs out much more quickly than Dashti would like. The girls are visited a few times by Saren's chosen betrothed, Khan Tegus, who is kind and funny and thoughtful. And then they are visited once by Lord Khasar, the man she refuses to marry, and everything goes wrong after that. 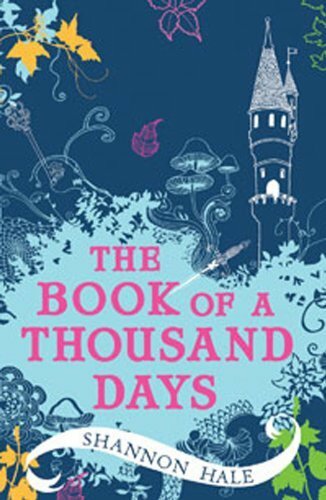 The book chronicles the girls' time in the tower, their escape, and their subsequent time in Khan Tegus' home. I was surprised by how much I liked Dashti in this book. While she is kind and courageous and wonderfully loyal, she also does whatever Saren tells her to do and has far too much patience with the brat, and that got tiring. But as the story continued, I realized just how ingrained the idea of the gentry being descended from god and the commoners being created solely to serve them was. I also understood that there were real consequences to Dashti disagreeing with or refusing Saren, and so her behavior made much more sense as I continued reading the novel. Dashti is really awesome. In many ways, she reminds me of Mulan because she's willing to take on roles that are very dangerous for her and could get her in a lot of trouble, but because she's that great, she just does it and deals with the consequences as they come. Saren, on the other hand, is an exhaustingly whiny person and I got tired of her real quick. She's like the Laura to Dashti's Marian, if you've read The Woman in White, except luckily for us and our modern age, Dashti is very clearly the heroine in this book. Hale sets this story in a fantastical version of Mongolia, and props to her for doing so! I recently visited the Field Museum's exhibit on Genghis Khan (which was lame, and I do not recommend going) and was so excited to see that setting brought to life here. What I most appreciated was that Hale created very strict rules for her society and then had all the characters and situations stick to them. Just because two people fall in love, it doesn't mean they can be together, for example - they need to convince the world around them that they are legally entitled to do so. I loved that she did this; it made the story much more realistic and made me tumble into love with the hero for working so hard to keep Dashti by his side. I read this book in one day, and it totally refreshed me! Highly recommended for those times when you're emotionally exhausted from a big, intense read and just want to settle down with something happy. I love to read books like this every now and again. I've not read any Shannon Hale but have heard they're very good. This is the first book by Hale I've read, but don't think it will be the last! I agree with you on every point you made! I loved this one also! Yay! SEE, you should trust my taste, then. I think you'd really like her! I remember enjoying this one when I read it, but I like the cover you had much better than the one I had! My book doesn't have a cover at all as it was a Kindle edition, but this one is beautiful, I agree! I am looking forward to the sequel to this book! I'm not to big on fantasy, however, this sounds like the type of book I could use right about now. Thanks for the great review. I like the sound of the social commentary you suggest, the narrator being the servant must provide quite a lot of insight. Glad I clicked the link you gave to LT, I was going to ask about the age category, what you describe could work well either way. It seems like this was a very refreshing book for you, and at a time when you really needed it. I like that the author stuck with his fictional rules in the book, and made his characters do the same. I am glad that you were able to find something lighter to read in between some heavier things. I think I would probably really like this one! I've read a lot of good things about Hale but haven't read anything by her yet. Thanks for reminding me that I should! This is one that is on my Mount TBR. I've read her Goose Girl books and really enjoyed them. I so need to read this! It's been on my wishlist ever since it came out, and it sounds like it would be perfect for a stressful/busy period. Hopefully my new library will have it. This was my first Hale, too, and still my favorite. Though I've definitely enjoyed her other books, this one is just... My love for it knows no bounds. Sounds like the perfect read for the time I am going through right now!